Mansion House Bed & Breakfast is two historic Arts & Crafts style homes built in 1904 and 1912, owner run and occupied. Separated by a courtyard/garden and swimming pool area, the houses provide small hotel intimacy and Bed and Breakfast charm. 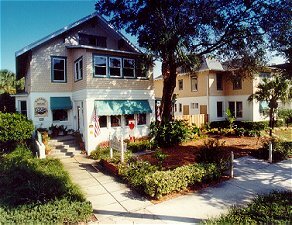 There are 12 bedrooms and 10 common areas furnished beautifully with handmade bedding, antiques, lovely wall coverings, Georgia pine floors with beautiful rugs, plus an overall atmosphere of comfort and charm associated with a traditional bed and breakfast. Great beds and breakfasts, comfy furnishings, first class amenities, and outstanding hospitality are trademarks of MH. Wedding ceremonies, receptions, high tea, family reunions, and special events can be individually planned for your special needs. Telephones/data ports, private baths, desks, TV/Cable, private label amenities, and robes in each room. Mansion House is AAA 3-Diamond, AB&BA 3-Crown, Superior Small Lodging, and is a Preferred Property for Bank of America.